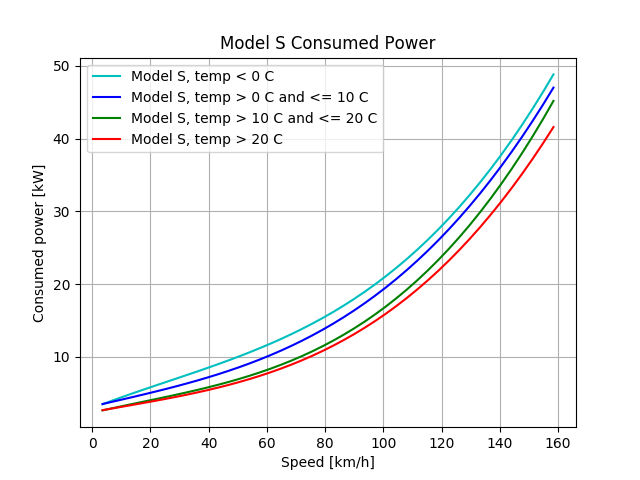 In the previous posts about Tesla Model S power consumption vs speed (and the same thing for Model X) we dove through the surface of the large pool of driving data generously donated by ABRP users. There is more than 2.4 million driving data points now, and in this post we dive a little deeper. EVs and how they are affected by outside temperatures is usually a hot topic, but perhaps most during the winter. Well, now ABRP has collected data all through the (northern hemisphere) winter and the beginning of the summer, so we have enough data to compare consumption of Tesla Model S and Model X in different temperature ranges – so why wait? 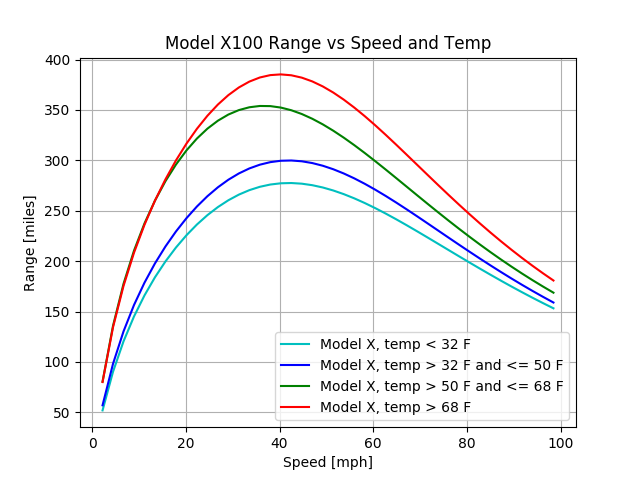 Note that this is completely empirical data based on what is reported by the Tesla API from each vehicle, including power consumption, speed, and outside temperature. No guesses. We have data from 511 vehicles with ABRP running while driving (you can donate data too by logging in to MyTesla in ABRP and leaving “Share Data with ABRP” checked). The method used to determine a power-vs-speed curve is the same as in the previous posts, and is based on finding the median steady-speed power consumption for each speed bin and then fitting a fourth order polynomial to the data. This polynomial can model everything from constant power consumption (even with zero speed) up to second order forces like drag (which become third order power). 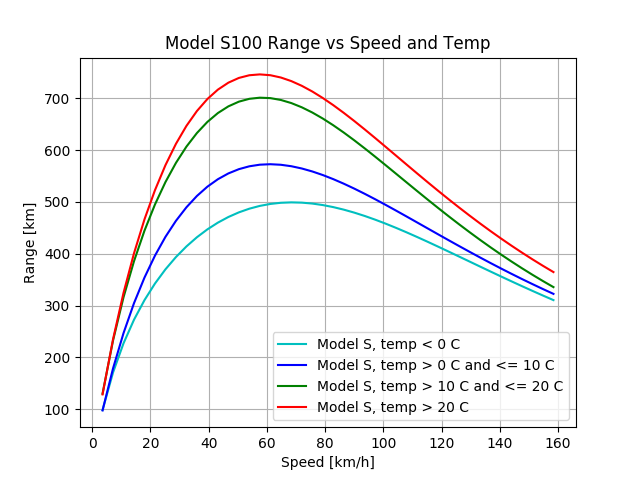 We split the driving data into four outside temperature bins: Below 0ºC (32F), between 0ºC and 10ºC (32F to 50F), between 10ºC and 20ºC (50F to 68F), and above 20ºC (68 F). Obviously outside temperature matters. There is a relatively constant power gap between the highest temperatures and lowest temperatues, indicating that the heaters do consume something like 5-6 kW at the really low temperatures. But then of course, colder temperatures also correlate with generally worse weather, like snow and rain on the ground. So it is hard to be completely conclusive about the cause – but the data speaks for itself. Cold weather driving generally consumes a lot more power. While it is unclear exactly what the source of higher consumption at lower temperatures is (heating, of course, but also worse ground conditions), it is very clear that on average, lower temperatures lead to significantly higher power consumption and therefore also less range. The maximum range of a Tesla Model S at temperatures below 0°C (32F) is about 22% less than at temperatures above 20°C (68F) – according to our real-world data from 511 vehicles. Pretty much exactly the same reduction, 22%, happens for the Model X. 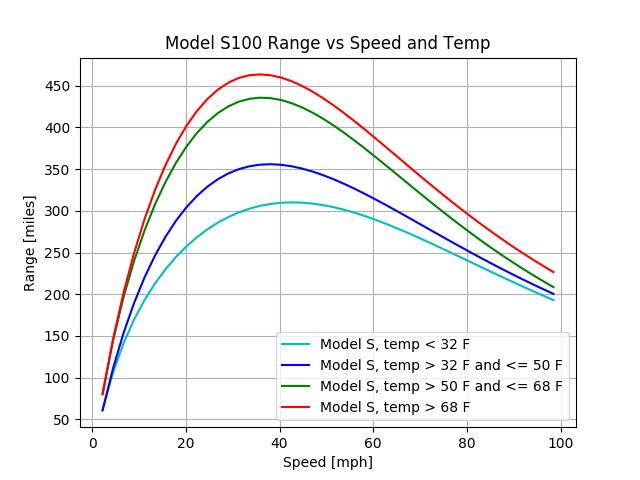 How Model 3 is affected by cold temperatures remains to be seen! Just ran across these charts. Excellent job of data collection and distillation! I didn't realize how strongly usage / range were correlated with temperature - very useful data to have.